Cologne's Gamescom event is the biggest games show in Europe and that means we're getting brand new looks at the most exciting games coming up this year and next. After both Microsoft and Electronic Arts splashed down at this year's Gamescom show with their big events you might be forgiven for thinking all the big stuff has already gone down. Not so, with the likes of the new Assassin's Creed, Dark Souls 3 and Metal Gear Solid 5 all releasing brand new footage at this year's event there's a whole lot of serious gaming to get your teeth into. Here are the latest and greatest trailers from the show so far. Okay, yeah, so no release date or release window, or anything resembling gameplay footage. But hey, check out the eyebrow acting from the textured bunch of polygons in that trailer! This 'Dawn' trail is set fifteen years before the game proper and while it doesn't actually show any real gameplay footage, everything shown has been rendered in-engine. Even the tears. Probably. This emotional offering sets up what is looking to be another heavy Final Fantasy and while the trailer may not have given an indication of a release window, Director Hajime Tabata has said at the show that we'll see the game launch next year. 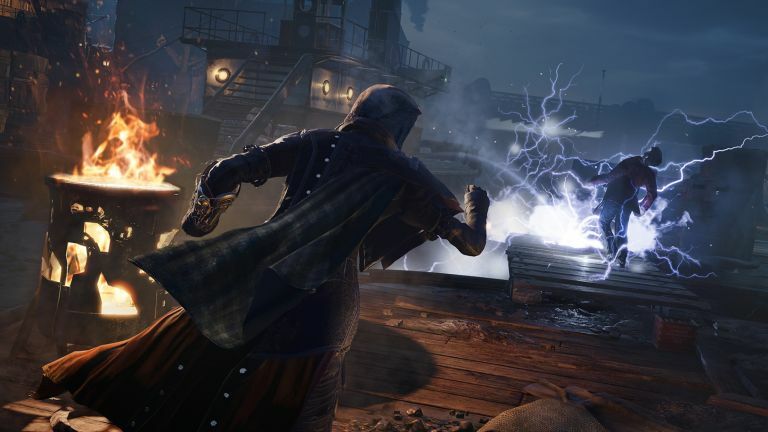 The next instalment of the Assassin's Creed franchise, Syndicate, is set in Industrial Revolution London, and is the first to feature two playable protagonists in the same locale. This latest trailer focuses on the twin characters, Evie and Jacob Frye. As it shows, Evie is the more Assassin-y of the two with Jacob rocking the gangland, kill first aesthetic. Assassin's Creed Syndicate is available on October 23 for Xbox One and PS4, though slightly later in the year for the PC version. The new trailer for Ubisoft's multiplayer shooter demonstrates the titular Siege game mode, where teams fortify their position with bombs and barbed wire and reinforced walls and such. Before the other team rocks up with flashbangs and guns and all the best-laid schemes gang agley. Ubisoft has also released a walkthrough of the new Spectator cam which is being brought into the PC version at launch and patched into the console games next year. We guess it's in the hope Rainbow Six Siege captures the eSports imagination. Rainbow Six Siege is available on October 13 for Xbox One, PS4 and PC. Throughout the story Clay recruits three other characters (his backup in the trailer) to build up his criminal empire in the Big Easy and take on the Italian bosses who currently run the city. Mafia III has only been given a 2016 release date so far and is coming on PS4, Xbox One and PC. With not long to go until the multi-platform release of the latest Metal Gear Konami has gone to town at Gamescom. Not only have we got the trailer showing whichever Snake this is (Plisskin? I thought he was dead…) doing his open-world assassin dance, but we've also got a huge 30 minute gameplay vid too. Metal Gear Solid 5: The Phantom Pain is out on September 1, for Xbox One and 360, PS3 and PS4 and PC. Frontier Developments has released a new gameplay trailer for the upcoming Close Quarters Combat Championships update. It's a free update that's already available on the Xbox One's Game Preview Program and will be coming to PC and Mac before the end of the year. The CQC update is all about the dogfights, not Elite: Dangerous' massive open-universe gaming. But the Xbox One release does get all that too, there's no dumbing down for the console release. Namco Bandai has this week delivered some gameplay footage of the next super-easy version of Dark Souls. You're definitely not going to find yourself constantly dying in this third iteration of the franchise, just look at the trailer - there's nothing there that would kill you. Difficulty aside, this is looking like a fine graphical upgrade to the existing games. Dark Souls 3 will release early 2016 for PC, PS4 and Xbox One.